"Turning to Apache Spark for big data analytics"
Apache Spark is the next-generation distributed framework that can be integrated with an existing Hadoop environment or run as a standalone tool for Big Data processing. Hadoop, in particular, has been spectacular and has offered cheap storage in both the HDFS (Hadoop Distributed File System) and MapReduce frameworks to analyze this data offline. New connectors for Spark will continue to emerge for extracting data from various data sources. 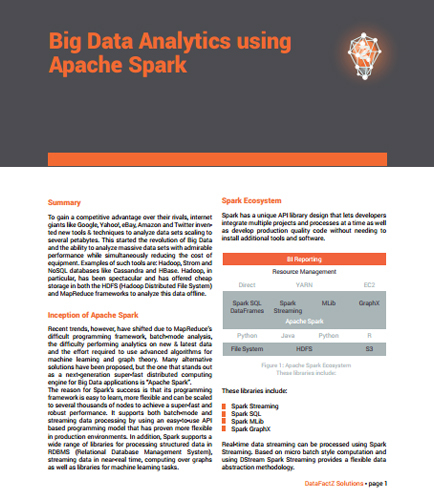 This whitepaper provides insights on how Apache Spark stands out as a next-generation super-fast distributed computing engine for Big Data applications. What is Business Intelligence Report ? A business Intelligence report composes of collecting and presenting data to be evaluated. Providing information to an organization by leveraging the power of Business Intelligence tools is known as Business Intelligence reports. Businesses need to make sure that the right information is transmitted to the audience and thus, to make this cumbersome task easier, various Business Intelligence tools including software and applications are used.